For most of the 20th century, Treasure Island sat quietly on the San Francisco Bay despite its prominent location. Nestled between downtown San Francisco and Oakland, the man-made, 405-acre island is now home to one of the country’s largest redevelopment projects. Essentially the entire island, along with parts of neighboring Yerba Buena Island will be completely re-planned and rebuilt at the tune of nearly $6 billion over the course of 15-20 years. Treasure Island was built between 1936-1937 as the site for the 1939-1940 Golden Gate International Exposition. The World Fair celebrated the completion of two major engineering feats of its time, the San Francisco – Oakland Bay Bridge (1936) and the iconic Golden Gate Bridge (1937). The island is adjacent to Yerba Buena Island where the San Francisco – Oakland Bay Bridge (Interstate 80) provides direct access to both major cities. When the festivities ended in 1940, the original plan called for a second San Francisco Airport to be built on the island, but as WWII loomed on the horizon, the US Navy became the new landlord. In the years following, the area served as a military base and clean-up site for Navy vessels, particularly those that were suspected of nuclear exposure. Rental housing was also constructed on the island. As of 2016, Treasure Island had 250 units for the homeless (about 700 people), and 650 market rate apartments. In 2006, a decade after the US Navy decommissioned Treasure Island as a military base, the San Francisco Board of Supervisors and the Treasure Island Development Authority (TIDA) approved plans to begin the city’s most ambitious redevelopment project. The development would help create thousands of additional affordable and market rate housing units for a city facing a critical shortage. San Francisco’s housing crisis has persisted year after year making it the most expensive city in the US. Median rent for a one-bedroom apartment is $3,590 per month. 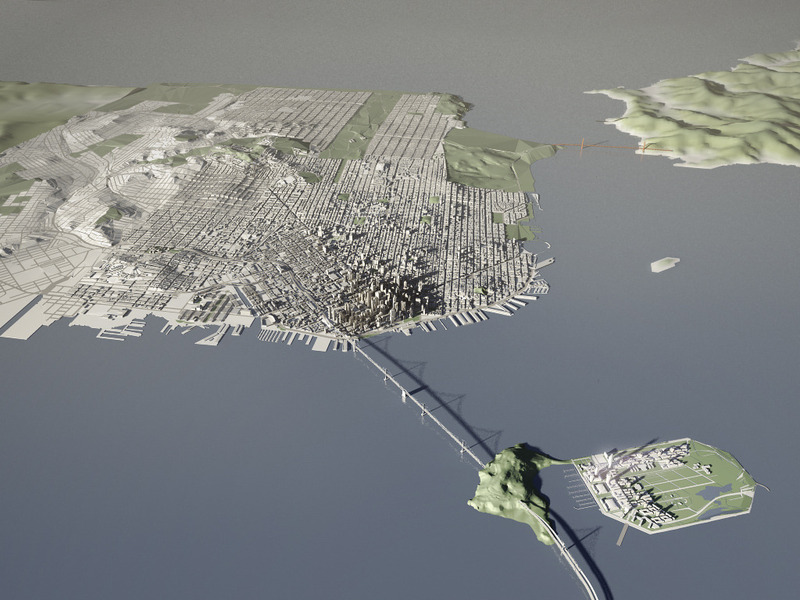 The shortage of affordable housing has become synonymous with the Golden Gate City. Construction on Treasure Island began in 2016. Over 270 public meetings were held and several plan revisions took place over a period of ten years since the initial approval. The current plan will provide 8,000 housing units, 300,000 square feet of commercial office space, and 200,000 square feet of retail in a mixed-use setting, and about 500 hotel rooms. In addition, the island itself is a state historic landmark with several registered sites on adjacent Yerba Buena Island also included in the redevelopment plan. The development will therefore be a mix of new and adaptive reuse buildings. Of the 405 acres on the island, 300 will be open green space, with a high-density masterplan for the development areas. The open green space also encompasses a large public arts component with renowned artists such as Ai Wei Wei, Andy Goldsworthy, and Sugitomo Hiroshi submitting designs. Treasure Island’s redevelopment is a public private partnership between the city of San Francisco and Treasure Island Community Development LLC (TICD). TICD consists of four developers Lennar Urban, Stockbridge Capital Group, Wilson Meany Sullivan LLC, and Kenwood Investments, LLC. 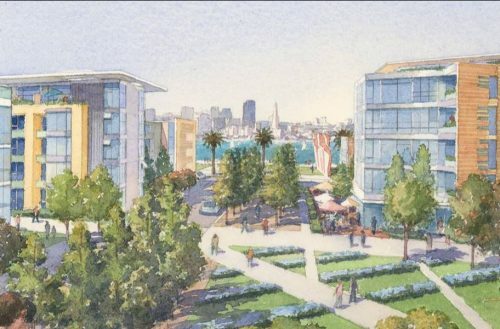 Over the course of ten years the developers will pay the Navy $55 million for about 450 acres which includes parcels on Yerba Buena Island that will be transferred in chunks. The cost for making the island suitable for building is estimated to cost developers $1.6 billion. The project design is led by architecture firms Skidmore, Owings & Merrill (SOM) and Perkins + Will, and is targeting LEED ND-Platinum certification, the highest level in green building. The city of San Francisco is using various financing vehicles to fund the public portion of the development. Of the 8000 homes, about 27.2% or 2,173 units will be offered below market rate. These units will be available to residents making up to 120% of the area’s median income or $120,000 for a family of four. An initial $155 million construction loan was secured through the EB-5 foreign investment program, predominantly from Chinese citizens. The city is also creating Infrastructure and Revitalization Financing Districts (IFDs) that would catch the tax revenues generated from the redevelopment districts and reimburse the developer for qualified public enhancements. The IFD is expected to generate $1.2 billion over a 43-year horizon. There are additional plans to create Community Facilities Districts (Mello Roos in California) which levy additional special taxes on the property owners to fund public infrastructure including significant costs anticipating sea level rises in the future ($250 million reserve). Bonds estimated at $780 million will also be issued in order to fund the first five project areas on the South-Western side of the island, which has some of the city’s best views of downtown San Francisco. The project is not without its share of problems. Transportation in and out of the island is a significant concern in a city already congested with frequent gridlock. 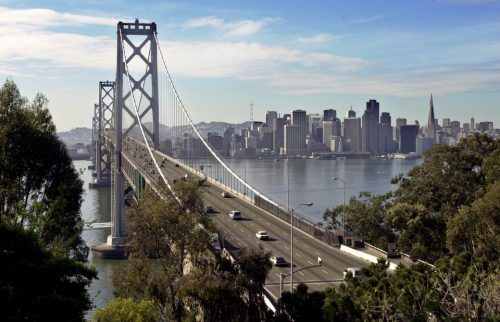 Interstate 80 is the only ground route for Treasure Island and Yerba Buena Island. The TIDA is placing pedestrian and bike options as priorities. Transportation demand measures such as mandatory household transit passes, parking policies, and ramp metering are expected to encourage use of public transportation options. The plan includes 10 miles of new dedicated bike trails, more frequent ferry services providing 45 daily trips (one every 15 minutes during peak hours), and clean buses that provide 12,000 daily trips to downtown San Francisco (one every 7 minutes during peak hours). The current development plan places 90% of the island’s population less than a 15-minute walk from the transportation hub. The island will also implement the nation’s first congestion pricing program. The site also faces continued scrutiny from watchdog groups that are wary of the Navy’s handling of radioactive cleanup on the island. In nearby Hunter’s Point where the Navy is also conducting remediation, it was revealed that nearly half of the tests done on the toxic site were fraudulent, requiring a complete retesting. Construction costs have also dramatically risen since the project’s approval, and the city continues to face challenges on committing to increased affordable housing units on the island. Each additional unit of affordable housing could now cost up to $650,000. Finally, rising sea levels are a concern for the island which may drastically change the infrastructure needed for the long term. 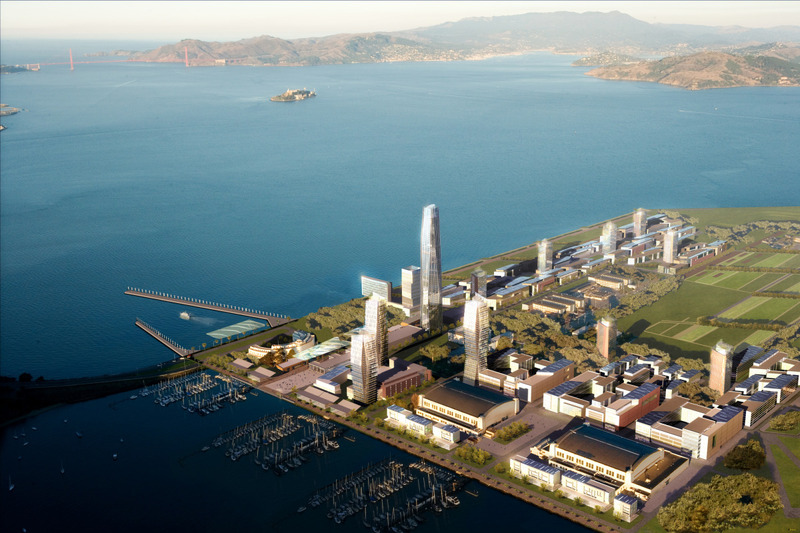 While the project holds serious risks over an exceedingly pro-longed period of time, the allure of Treasure Island’s rewards continues to propel the city of San Francisco and developers towards ongoing work on one of the nation’s largest redevelopment endeavors.